2018 was an amazing year for the French-born DJ and producer as he dominated the house scene with the crescendo highlight being voted No 1 Afro House Producer on Traxsource. Very few producers manage to escape the constraints of genre barriers in their work, but Manoo somehow does this with ease. Be it Soulful, Afro, House, Ambient or Techno his musical DNA continues to push the boundaries and interweaves all the right elements. 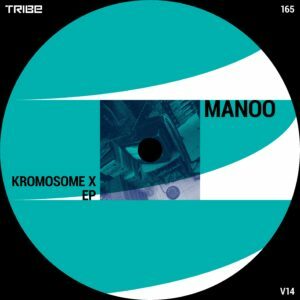 Speaking of DNA his latest production sees him return to Tribe records for vinyl and digital releases to deliver the Kromosome X EP. Kromosome the title track with its thunderous atmosphere manifests a storm in its journey. DJ’s take note, this is the track that takes your dancefloor to the next level. The bass pulsates with a dark tone throughout whilst the synths swirl and flies into realms activating your DNA to dance and causing your Kromosome gene to express itself through its nucleus and molecular machinery. Just when you thought you had peaked Manoo has no mercy. Enter his signature Mystical Gong on Elektronikart to warn you he has more to offer. With his ability to tell a story through sound Manoo effortlessly directs this composition in a way that each musical component is having a conversation.